Bangladesh captain Shakib Al Hasan and squad member Nurul Hasan have been fined 25 percent of their match fees and were also handed one demerit point each for breaching Level 1 of the ICC Code of Conduct in the fracas that marred their win over Sri Lanka on Friday. "Shakib was found to have breached Article 2.1.1 of the ICC Code of Conduct for Players and Player Support Personnel, which relates to "conduct that is contrary to the spirit of the game", while Nurul was found guilty of violating Article 2.1.2, which deals with "conduct that brings the game into disrepute"," the ICC said in a media release. "The incident involving Shakib happened in 19.2 over of the Bangladesh innings when he came to the edge of the boundary and gestured at his batsmen to come off the field while remonstrating against an umpiring decision. 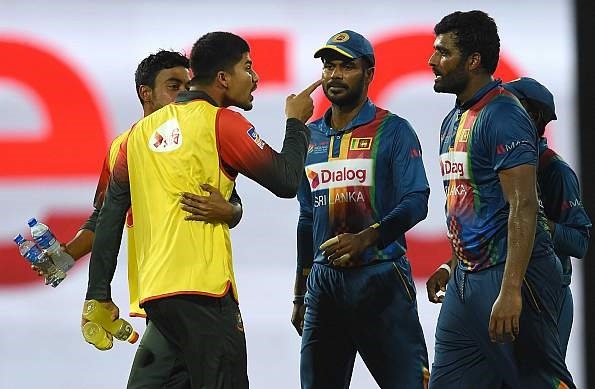 As regards Nurul, the reserve player argued and pointed finger at Sri Lanka captain Thisara Perera which led to unruly public behaviour after he was sent by the team on to the field of play to pass on a message to the two batsmen," the release further stated.